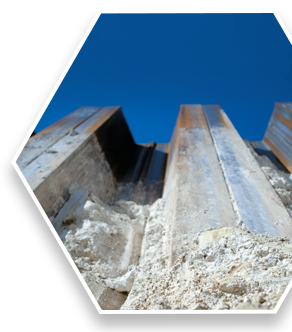 King Sheet Piling is a trading name for the patented sheet piling system described on this website. 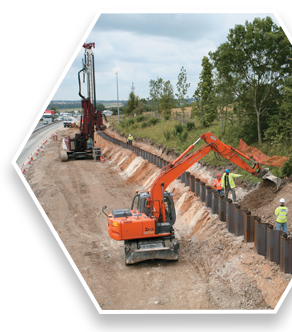 (KSP®) is a Balfour Beatty UK registered trade mark. 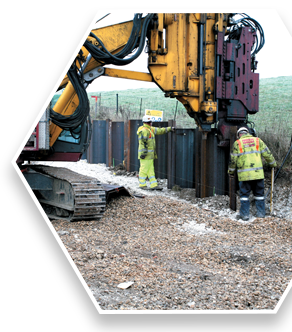 In order to improve the services provided to customers, Balfour Beatty reserves the right to make changes to any of its King Sheet Piling (KSP®) products or services at any time without notice. 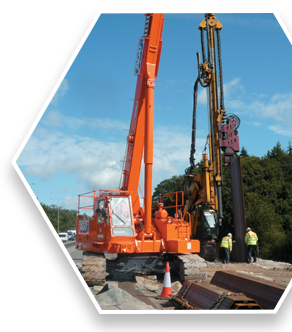 Any reference to any King Sheet Piling (KSP®) product or service which has been or may be provided by Balfour Beatty or any other company does not amount to a promise that such product or service will be available at any time. Outside the jurisdiction of the United Kingdom, it may be that the publication of documents or the dissemination of information appearing or occurring on this website is subject to legal restrictions. Accordingly, any persons in a jurisdiction outside the UK into which such documents are released or such information is disseminated must establish the extent of such restrictions and ensure their compliance with such restrictions. All information contained herein is provided for information only, save where the contrary is expressly stated. In no circumstances shall the content of this website constitute an offer, which is capable of acceptance, in any jurisdiction in which it would be illegal to make such an offer. 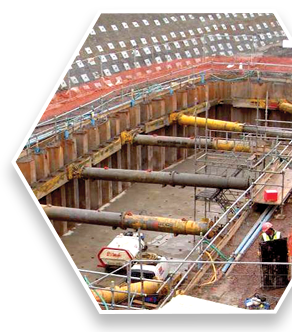 All intellectual property rights (including, but not restricted to, patents or copyright) in this website are owned by Balfour Beatty except where this is otherwise indicated or might otherwise be reasonably inferred. No images, trade marks and brands may be copied, reproduced, used or otherwise appropriated for use without written permission of the owner. Provided that the patent or copyright in any print or copy is visibly acknowledged, you may print or copy such parts of this website as may be reasonably necessary for your own personal use unless this is expressly prohibited by a notice published on any page. No other or further printing or copying is permitted. All other use is prohibited. 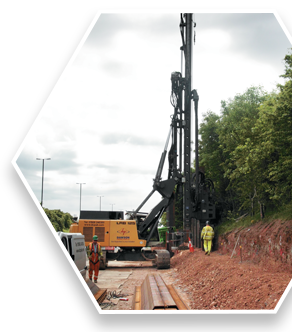 Content and information provided by third parties to Balfour Beatty for King Sheet Piling (KSP®) is identified where it appears. 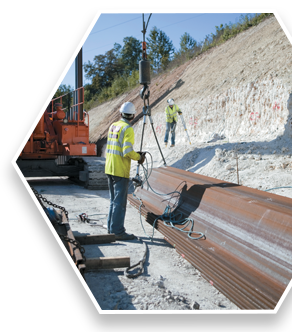 Balfour Beatty is not responsible for the accuracy or veracity of any such content and information and you must take appropriate steps to verify this information before acting upon the same. 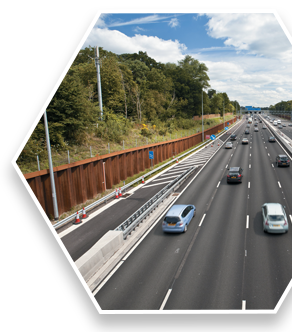 Balfour Beatty is not responsible for the content of any other website from which you may have accessed this website or to any hyperlink from this website. 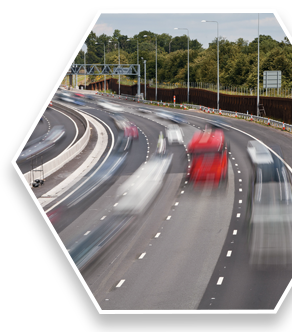 Balfour Beatty shall not be liable to you for any loss or damage that you may incur as a result of your use of any such website. If these conditions of use (or any part thereof) are found to be illegal or unenforceable by any court of competent jurisdiction, such condition or part thereof shall be deemed not to form part of these conditions but the remaining conditions shall remain in full force and effect. These conditions of use are governed by the laws of England and Wales and the courts of England and Wales shall have exclusive jurisdiction in any dispute.